PINOCCHIOWEN TRIES TO SILENCE CRITICS OF HIS ‘REIGN OF ERROR’ AT HORSEWORLD – BRISTOL UNI CAVES IN TO THREATS? What a curious development in the never-ending saga of management mishaps in the upper echelons of HorseWorld. On Monday the Bristol University newspaper Epigram published an article about recent events at HorseWorld on its website. It covered many of the allegations which The BRISTOLIAN first brought to public attention. By mid-morning on Tuesday, readers began telling us that the article was no longer being displayed. 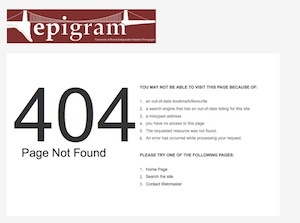 We attempted to contact Epigram and its editors, the Student Union, the University’s Press Office and the UoB management, to find out what had happened. No one got back to us. Then a source close to HorseWorld MD Mark ‘Not That One’ Owen told us what seemed by now to be obvious: the article had been pulled after a furious Pinocchiowen was “straight on the phone to the Uni [yesterday] morning” to demand that the article was removed. We then posted a link to a cached version of the article still available via Google. Today that Google cache version has also been taken down. There’s a “scandal brewing” at the sixty year-old charity HorseWorld, with fears that it may have to reduce its activities and make more than 25 staff redundant after the failure of its bid for planning consent to permit the sell-off of land to developers. This is in tandem with reductions in income, a situation “mirrored by the fates of charities across the country” as donation levels drop off. The article then crunches some of HorseWorld’s numbers: its income fell by nearly £200k from £1.25mn to £1.06mn in 2010-2012, with voluntary donations dropping from £728,046 to £398,214 over the same period. Next it is pointed out that Owen’s strategy for rectifying HorseWorld’s financial freefall – an all-or-nothing green belt planning gamble – was about as high-risk as you could get. The phrases “financial mismanagement” and “major mistake” are used. Finally, the author summarises, suggesting that what has been happening in the management of HorseWorld “is a perfect [but extreme] example of what is happening across the country.” Ultimately, when a charity sees income drying up and managers not acting appropriately, it is the good work which suffers most. Note 2: This morning (13/2/14) a person claiming to be Max Miller, the author of the article, contacted The BRISTOLIAN via the comments section to request that we “kindly delete this article and not publish it in part or in whole anywhere else on or off-line”, and that it ”was an oversight that led to its publication not censorship”. Having subsequently confirmed that this was indeed the University of Bristol student Max Miller, and the acknowledged author of the article, we have removed it. This entry was posted in Bad Bosses, Meejah, News, The Chugger and tagged Alex Bradbrook, Epigram, Horseworld, Jos Franks, Mark Owen, Max Miller, University of Bristol, webxclusive on February 12, 2014 by Jooohn Ag.